analyzing larger data sets, from more data sources, to drive their decision-making. They are examining huge volumes of unsampled data to make informed business decisions--often mining information in business intelligence tools for strategic insights. For the data scientists that perform these analyses, having direct granular access to Google Analytics data is becoming increasingly important. Today at I/O, we announced that we are giving Google Analytics Premium users the ability to glean new business insights by accessing session and hit level data and combining it with separate data sets. Organizations and developers can analyze in seconds without massive cost by leveraging Google BigQuery, a web service that lets developers and businesses conduct interactive analysis of big data sets and tap into powerful data analytics. The upcoming BigQuery integration, happening later this year, is a planned feature for Google Analytics Premium that allows clients to access their session and hit level data from Google Analytics within Google BigQuery for more granular and complex querying of unsampled data. 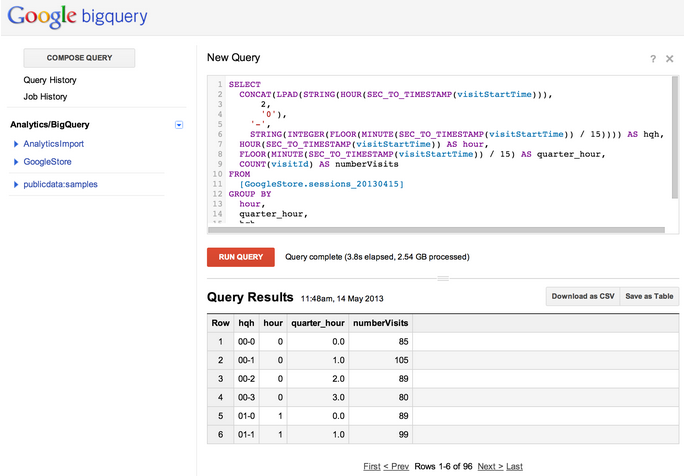 For those unfamiliar with Google BigQuery, it’s a web service that lets you perform interactive analysis of massive data sets—up to trillions of rows. 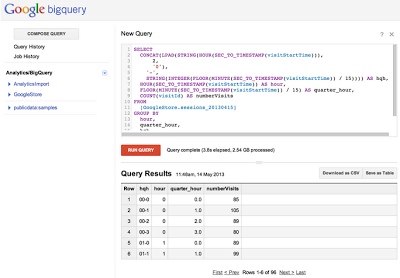 Scalable and easy to use, BigQuery lets developers and businesses tap into powerful data analytics on demand. Plus, your data is easily exportable; you own it. Leverage Google’s massive computing power to get business insights from big data in seconds rather than hours. Analyze massive amounts of data in the cloud with no up-front investments (hardware provisioning or software licensing investments). Share and collaborate quickly and securely using Access Control Lists. Store as much as you want, paying only for what you use. Protect your data with multiple layers of security from Google. Analyzing visitor behavior across very large date ranges. Answer the question: "From 2010 to 2013, which sections of my site had the most volatility in daily traffic volumes?" Joining against data from other sources. Make detailed, custom analyses, such as: "I have a database that contains all the metadata about each article posted on my site and would like to see the bounce rate, conversion rate and new visitors generated by author and topic." Understanding complex queries. Answer the question: "Of the visitors to my site that used a voucher code, how many originally discovered my brand from a voucher code site and how many left the checkout process and returned within 10 minutes with a voucher code? Which codes were used in each case?" Integrating with Data Warehouses. Make detailed, custom analyses, such as: "On a weekly basis, for each of my logged in customers, I want to see the top 5 products that they viewed but did not buy and add that information into their record in our CRM." We are looking forward to getting this granular data access into the hands of developers and data scientists. To receive more information about this integration as it comes available, developers may register their interest here: http://goo.gl/QJR9Y. The landscape in data analysis has changed rapidly in the past few years. Organizations and developers are analyzing larger data sets, from more data sources, to drive their decision-making. They are examining huge volumes of unsampled data to make informed business decisions--often mining information in business intelligence tools for strategic insights. For the data scientists that perform these analyses, having direct granular access to Google Analytics data is becoming increasingly important.